FOR ALL OF LEE'S DIES AND DIE SETS. CLICK LOGO ABOVE AND GO TO LEE'S "PRODUCT SUPPORT KNOWLEDGEBASE". GO TO BOTTOM OF THIS PAGE TO VIEW "YOU TUBE" HELP VIDEOS. The bullet feeder is designed to directly fit the Lee Pro 1000 and Lee Load-Master presses. Automatically feeds bullets into the mouth of the seating die for pistol calibers only. Align bullets more accurately than possible by hand. Increases the cyclic rate 50 to 100%. The Bullet Feed Kit is complete for one bullet diameter and range of length. To convert to another caliber or bullet length select appropriate Feed Die & Fingers. 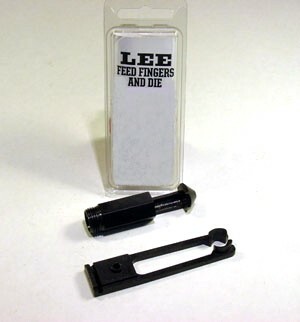 If you already own a complete Bullet Feed Kit, purchase Feed Die and Fingers to convert to another caliber or bullet length. View the below list to select your appropriate bullet length and diameter. NEED SHELL HOLDERS, BUT NOT SURE WHICH YOU NEED? OR TYPE LEE NUMBER IN SEARCH BOX AT TOP OF PAGE. How to set up your Lee bullet feeder to work the right way. Click the button below to add the Lee 90887 * Pro 1000 and Load Master Progressive Press * Bullet Feeder Die and Fingers * 9mm to .365 Diameter * From .46" Up To .60" Long to your wish list.